On 23 February 2016, as part of its global “100 Thousand Solar Lanterns Project”, Panasonic donated 2,400 solar lanterns to 15 Non-Governmental Organizations in the Philippines, bringing the total number donated to the country to 5,814. The donation ceremony was held at Panasonic Manufacturing Philippines Corporation in Taytay, Rizal. The donation marks the third of such efforts under the “100 Thousand Solar Lanterns Project” in the Philippines. Last February, we donated more than 2,300 solar lanterns to 18 organizations. The lanterns aim to address social challenges faced by people living in off-grid areas of the country. 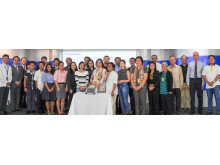 In December 2013, Panasonic donated more than 1,000 solar lanterns to the Department of Social Welfare and Development (DSWD) of the Philippines government, as part of its disaster relief efforts following Typhoon Yolanda. In the Philippines, 21% of its population is said to have no access to electricity. Availability of light and electricity affects quality of life. The “100 Thousand Solar Lanterns Project” came about with the aim to provide electric lighting to enhance access to education, healthcare and business opportunities through the use of the company’s own technology and product. 1.Center for Excellence in Special Education (Stepping Stone) Foundation Inc.
2.Conrado and Ladislawa Alcantara Foundation Inc.
4.Health and Dev't for All Foundation, Inc.
5.Integrative Medicine for Alternative Health Care Systems (INAM) Philippines, Inc.
6.Interfaith Partnership for the Promotion of Responsible Parenthood, Inc.
7.Jesus V. Del Rosario Foundation, Inc.
9.Konkokyo Peace Activity Center Information Office, Inc.